I used the light from my camera, peeled off 100 Quetzales and handed it over. He told me, “cien por persona.” He must have thought we were together. We weren’t. She paid her hundred and he continued to collect from the six or eight other people joining us. It was too dark to get an exact count. He put the money in his pocket and slung his shotgun over his shoulder and started toward the entrance gate. As he passed me again, with help from the faint moonlight, I noticed the embroidery on his shotgun strap. The gun seemed extremely special to him, I just hoped he wouldn’t need or want to take the gun off that shoulder. He began at a brisk pace and the hike felt like a near military march as we were led through the gate and into the jungle. As someone not used to any 4 a.m. wake-ups I felt it. My legs felt it. But we needed to arrive well before the park opened and I suspected he needed to return to his post for work. The sunrise hike was not part of any “official” tour. There are tours available, but they cost more, not to mention you also need to pay the park entrance fee (150 Quetzales). So for a 100 Quetzales this was certainly a bargain. 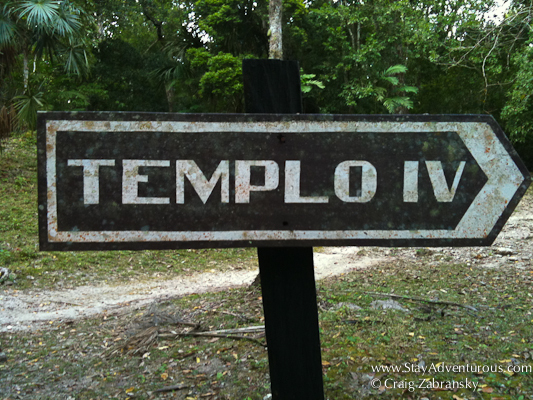 We continued through en route to Temple IV, the very place I watched my Tikal sunset the night before when I had met the guard who offered me this “tour” and I recalled we faced due east. As long as the weather cooperated and the thick fog lifted, I expected a perfect sunrise. The pace quickened. I stumbled and nearly tripped. I slowed down to fix my boot and the others just passed me. No one was talking and no one wanted to fall behind. We all needed to keep up as the jungle began to wake up. The howler monkeys were up now and although the loud howls instilled some fear, we were told they were harmless. I had done the hike a day earlier so at times the signs and paths seemed slightly familiar. Yet at other times I just hoped we took short cuts as the same paths seemed new. It was still too dark to be sure. We kept on with the brisk pace and suddenly arrived. I decided to rest for a minute before climbing the steps. Yes, in Tikal, you don’t climb on the temple stones but rather wooden stairs built next to the steps, and Temple IV had plenty. Eventually I made it to the top and left the wooden platform to finally step onto the cool, wet stone. A few folks had already arrived and staked out their viewing places, while others still lagged behind. I moved across the stone and found my spot. My phone read – 5:17a.m. On the top, a fog seemed to come and go like a ghost. At times, stars appeared in the sky and then disappeared. The fog lifted but often returned thicker than before. It almost seemed like a wall, or an object you can touch. 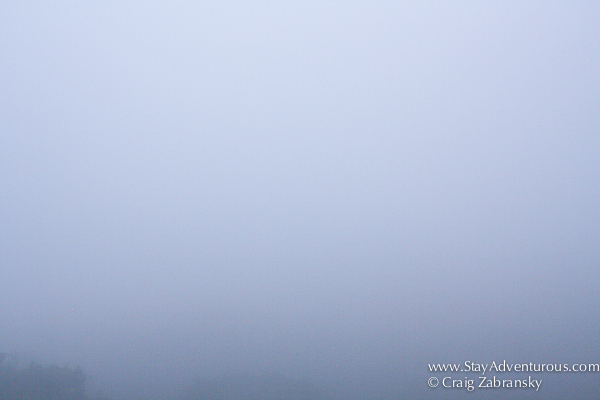 With such limited visibility, I wondered if we would even be able to see the sun rise over the jungle. As time continued to move forward, howler monkey calls echoed across the thick forest with growing intensity. I imagined what an unknowing explorer might have thought of such sounds when trekking through this terrain hundreds of years ago. Frightened, no doubt. Then to add to the moment a new group arrived. The eventual English words made me realize this was another “tour” and maybe even the “official” tour. They seemed quite surprised to see us already sitting on the top. Light arrived as an intense whiteness through the fog, but the wetness continued to keep us all cool. People left, new ones arrived and the park was open. By 730 a.m. I could finally see the distant temples. I debated heading down myself, but instead I waited. Already nearly four hours had passed and I wanted to see the sun. Then just before 8 a.m., I finally started to feel the warmth of the sun. I finished writing a few words in my journal, attempted a sketch of the scene and decided to take one last image before my descent. In the park so early, I knew I’d enjoy walking the grounds of Tikal with hardly any other tourists, so I spent the next few hours exploring. Watching the sunrise was a welcome change, as I normally prefer sunsets. 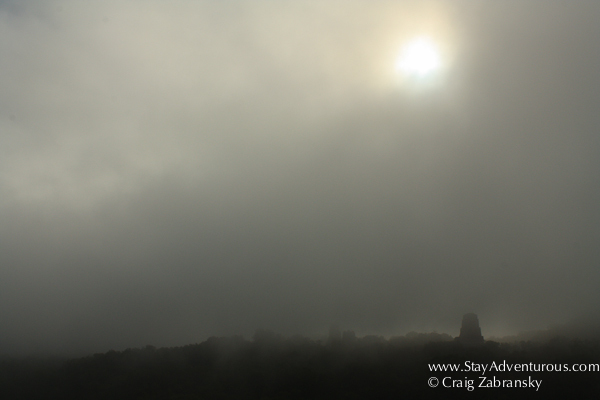 Sure, it wasn’t the perfect sunrise with such limited visibility, but with the chance to experience it at such a mystical site, Tikal, it will be a sunrise I always cherish. And like some sunsets, the sun itself wasn’t the entire show. The mystery and magic of the setting and the moment proved just as important. Travel Tip: Be silent. Listen. 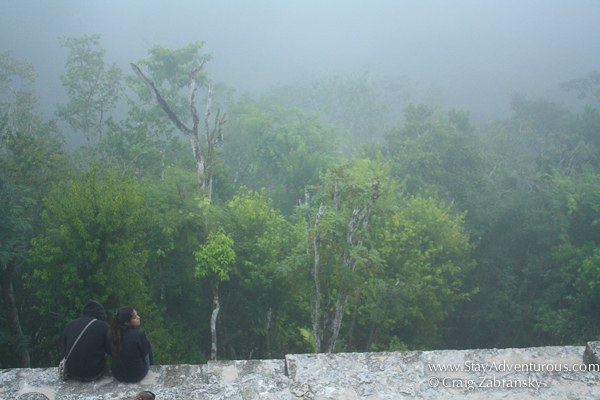 On my excursion, a couple on top of the pyramid kept chatting, chatting and chatting. I asked them to be quiet but then and I eventually moved away from them. Listening to the sunrise from the jungle is just as rewarding as seeing it. 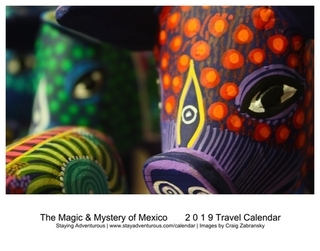 This post is part of the Get To Know Guate Series. I really loved this narrative—great capture of every moment and detail! @a6e7624bba62b45ac3215aab247f00ff:disqus thanks, I appreciate it. It was quite a morning and well worth it. @b915649d0a8be7621cd097b127a77671:disqus thanks, I’ll have a few more photos of Tikal in a photo essay soon. Ahhh…you set the scene so well. Bravo, Craig! I kept waiting for something to jump out of the bushes. 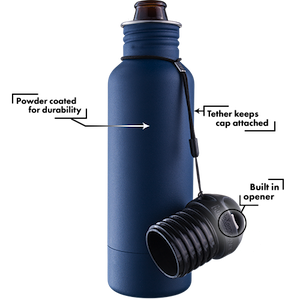 Your piece is a testament to the saying, “The early bird gets the worm.” You got one hell of a great worm that morning. sure did Leah, it was a very memorable sunrise. You are a talented writer indeed! What I don’t know is… where is this place? Thanks Ana for those kind words… and yes, I often need to tell more about the location for travelers…Like a how to get there, and where exactly there is…. Tikal is in the Jungles of Guatemala in an area called Peten. It took me 10 hours on an overnight bus to get to the town of Flores a popular stop off point to Tikal from Guatemala City. I hate it when chatty Cathy ruins a great moment. I’m glad you ask the chatty people to be quiet. Great pics! thanks appreciate it. Yeah, I don’t see many sunrises, but this one makes me want to see a few more… And it was a bit annoying, it had to be said. Great story! I felt like I was with you on the trail! hiking on a foggy trail in the dark while animals howled in the forest would be sooo unnerving. Beautiful writing here Craig. 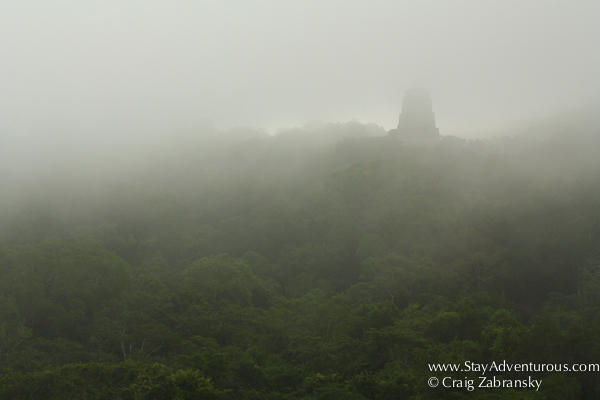 Tikal is in my top 3 North American destinations right now…I can’t wait to make it there. The fog definitely adds some mystery and intrigue to the setting. Thanks, appreciate it. Curious about your other two top N American destinations…, but Tikal is a worthwhile selection. Definitely. Wow, pretty cool! The fog must have made almost mystical to be there. Kudos for waking up that early! OK, I had not read Lauren’s comment before I wrote mine! Mystical I guess is the perfect word for you what shared with us here! Marvelous photos and a fantastic experience! I love your tip about just listening… Who needs to speak surrounded by views like that? Even though you did not get to see a classic sunrise, the sun penetrating through the fog was just as cool. Too bad there were some chatty Kathys spoiling the mystical serenity of the experience. Rock on It’s a magical place…and it’s even more magical when you can get there as part of a non-official group early in the morning. Good on you, and great photos! Great storytelling! The photos are awesome, too. The fog may have marred your view of the sunrise but it sure made for some cool photos. It sure did… and I have some Tikal Photos coming soon without the fog that are pretty awesome too… It’s a magical place. 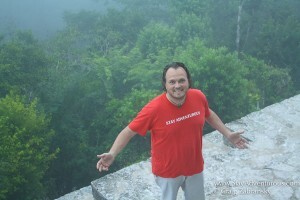 Gracias Dana, thanks for finding this older post, it was fun to reread myself and remember that special sunrise.